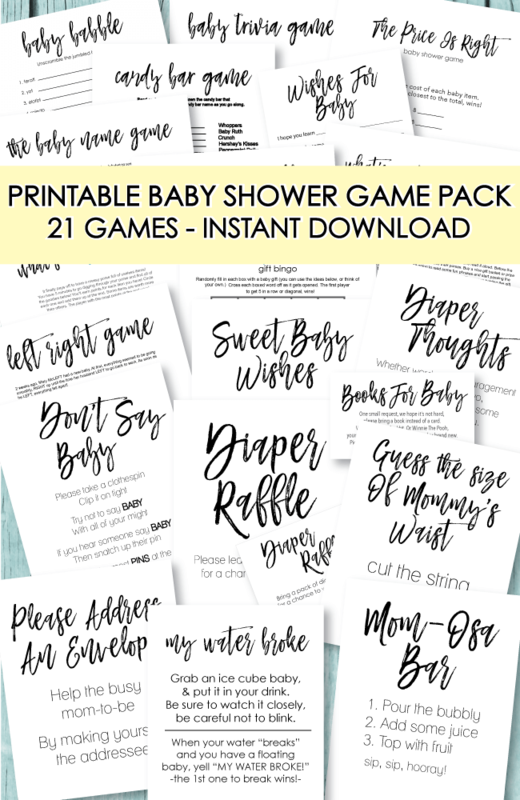 I was so excited and honored to plan and host a baby shower for my sister, Nicole, who is having her first baby. 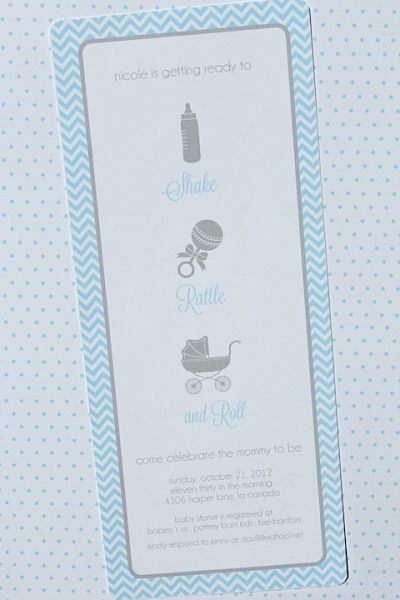 Nicole came up with the theme of the party, Shake, Rattle and Roll and I created the images to fit each of the words in the theme - a bottle, rattle and carriage. I tried to use the shake, rattle and roll idea in all parts of the party. We settled on an icy blue, silver and white color scheme. Since Nicole is the writer of a fashion blog, I wanted the shower to be feminine, sophisticated and modern just like her fashion tastes. Lots of 36 inch white balloons tied with silver and blue tassels, which I made out of ribbons and a metallic fringe door curtain found at Party City, framed the yard. Under the welcome sign was a bench with shake, rattle and roll pillows made by our mom. This is where the guest posed for pictures with the Nicole. The shower was set to be outside but real showers made lots of last minute adjustments necessary. 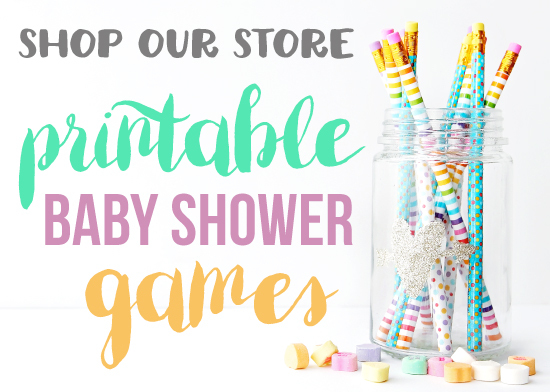 We used Nicole’s changing table to create the “Bottles” station where guests could pick from a variety of sparkling waters, Ready to Pop Soda, champagne and lemonade. Wine glasses had mini charms tied on with bakers twine. Rock candy sticks with mini pacifiers that had been spray-painted silver complimented the champagne glasses and all water bottles and soda bottle were personalized. A Bottle Bucket was also filled with additional drinks. 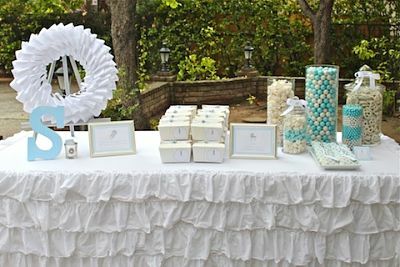 For the dessert table, I enlarged the images from the invitation and mounted them in silver frames. 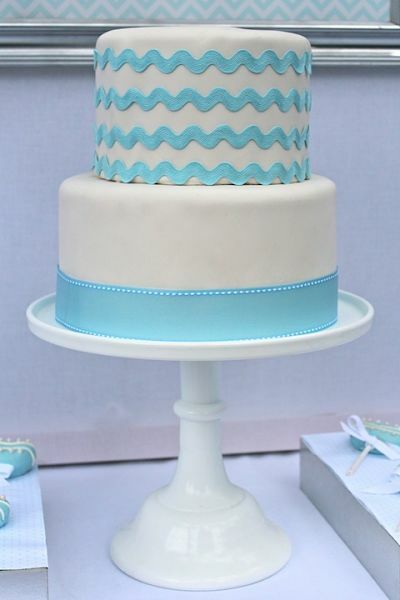 The centerpiece was a banana cake, the mommy-to-be’s favorite, decorated in a chevron pattern to match the printables. Of course, we had shakes, rattles (cake pops) and rolls (cupcakes which were gluten free for some guests). For the shake bottles, I used my Cameo Silhouette machine to cut vinyl decals. Other sweet treats included shake, rattle and roll sugar cookies custom made by Lizy B. Bakes, white chocolate mousse in mini baby food jars and boy oh boy chocolate bars. 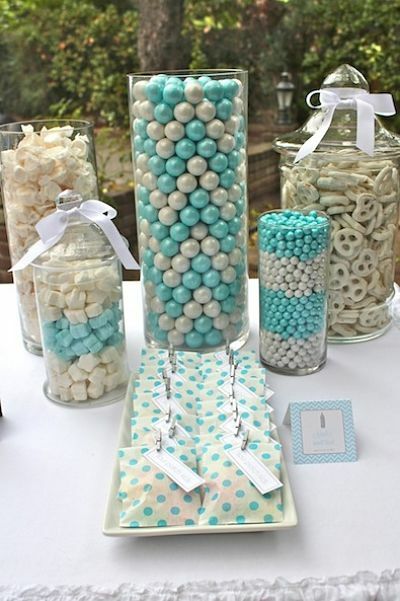 We also had a candy station with blue and white gumballs layered in a chevron pattern (inspired by Paiges of Style), sixlets, taffy, yogurt pretzels, blue and white star marshmallows, and sour patch kids (the mommy to be’s favorite) in mini bitty bags sealed with mini clothespins. Guests were given midnight feeding boxes to fill with treats. 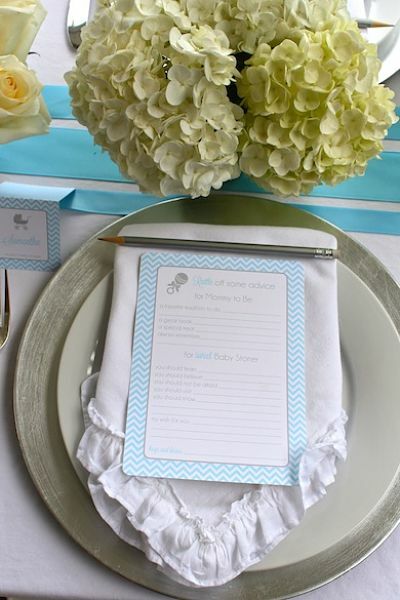 As the guests arrived, they were asked to sign a baby book for the baby. They also added a suggestion for the parents to be to the name wreath. 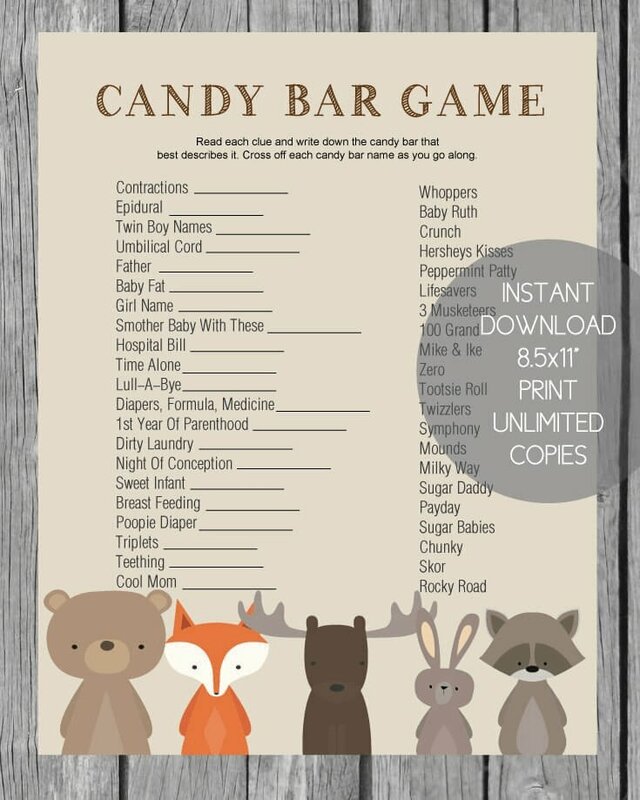 At each place setting was a card asking the guest to “rattle of some advice for the mommy and baby to be.” FAVORS Friends took home boxes of mini chocolate kisses with shake, rattle and roll stickers on the bottom and tags thanking them for rolling by. 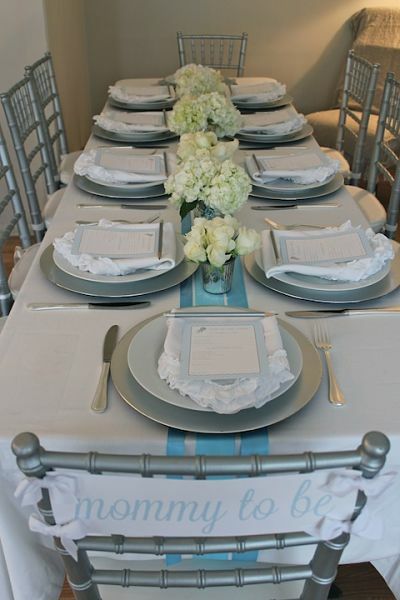 The printables were all created in the soft icy blue, white and silver color scheme with chevron and mini dots patterns. 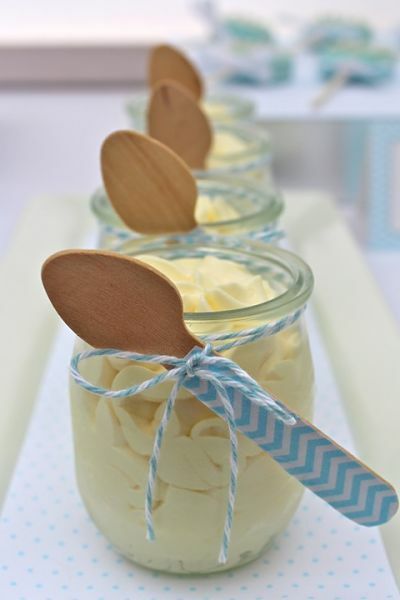 Can I ask where you got the mousse jars?